Creating a website is no longer a luxury for some people, it is now a necessity. If you are a business and are not online then you are doing yourself a huge disservice, and it is likely that all your competitors are grabbing a slice of the pie, whilst leaving you in the lurch. Many people have decided not to go online because they feel it is a ‘huge cost’ and they don’t have the funds to spare at the moment. Well did you know that there is a lot of incredibly powerful open source software out there which not only makes putting a website online a breeze, but it is also incredibly cheap to run since you will only have to pay for hosting and a domain name. Firstly, let’s discuss a little bit about a CMS, or Content Management System actually does. To put it simply, it is a fully complete way for you to handle your online sales and management of your online content. It is incredibly simple to update, and many people, even without technical language are using a CMS every single day to run their business and generate profits. However, with a huge array of systems out there it is hard to know what the best is, so let’s take a look. This is possibly the best content management system around, almost every blogger or small business worth their salt will use WordPress. With a number of plugins available to help you achieve the aims of your website, as well as a plethora of different themes out there, getting started on WordPress is incredibly easy. Since it is free, you will be able to get a complete website up and running within a couple of days. Want community support? Don’t worry, the million+ WordPress community users will be able to help you out. Joomla is created in a similar vein to WordPress in that it is a freely available content management system which has been created in PHP. Quick deployment of content also makes it incredibly handy. The only problem is, there isn’t as much free content out there theme and plugin wise, therefore it could cost you money in the long run. Upgrading the site with security updates and patches can also take some time depending on the modules and components installed. 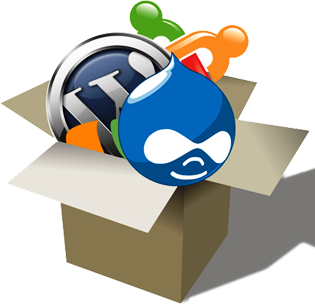 Drupal is another freely available content management system, and it has been making the rounds online since 1999, and it has been developed substantially since then so you know you are getting something good. It is easy to customise and manage content on this software package. It is certainly worth testing. Umbraco is another CMS. However, it is slightly different to the others in the list so far. This is because it designed on the ASP.NET framework and is only suitable for deployment on Windows Servers. It isn’t really used by ‘smaller companies’, however if you have a large company (i.e. hundreds of thousands of visits a day) this is probably one of the best systems to go for. Social Networking Sites are all the rage at moment, so it could seem potentially lucrative to develop your own. This is where ‘Pligg’ comes in. Pligg allows you to create a social site with all the usual features, including booking marking, blogging and a voting system. This is fantastic for companies that are looking to start a network around their niche. Since all of these systems are free, it is worth testing out each individual one to see which is best for your needs. All provide online demos and testing systems to try different scenarios before installing. Don’t forget to look into the plugins and themes available for each platform. This should hopefully help you out with your final decision and picking an appropriate CMS for your business. We at CMather Web Development can install all of the following Content management Systems within a few hours depending on your requirements. All our cPanel web hosting packages come with these packages ready for pre installation and can be deployed within a few minutes. If you require further help or clarification on choosing an appropriate Content Management System, please contact our Help Desk.